The convergence of connecting people, things, data and processes is transforming our life, business and everything in between. 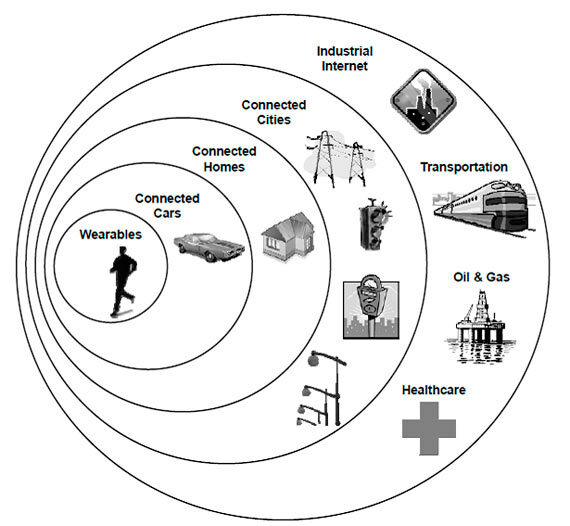 The technical definition of The Internet of Things (IoT) is the network of physical objects accessed through the Internet. These objects contain embedded technology to interact with internal states or the external environment. In other words, when objects can sense and communicate, it changes how and where decisions are made, and who makes them. Cheap sensors – Sensor prices have dropped to an average 60 cents from $1.30 in the past 10 years. Cheap bandwidth – The cost of bandwidth has also declined precipitously, by a factor of nearly 40X over the past 10 years. Cheap processing – Similarly, processing costs have declined by nearly 60X over the past 10 years, enabling more devices to be not just connected, but smart enough to know what to do with all the new data they are generating or receiving. Smartphones – Smartphones are now becoming the personal gateway to the IoT, serving as a remote control or hub for the connected home, connected car, or the health and fitness devices consumers are increasingly starting to wear. Ubiquitous wireless coverage – With Wi-Fi coverage now ubiquitous, wireless connectivity is available for free or at a very low cost, given Wi-Fi utilizes unlicensed spectrum and thus does not require monthly access fees to a carrier. Big data – As the IoT will by definition generate voluminous amounts of unstructured data, the availability of big data analytics is a key enabler. IPv6 – Most networking equipment now supports IPv6, the newest version of the Internet Protocol (IP) standard that is intended to replace IPv4. IPv4 supports 32-bit addresses, which translates to about 4.3 billion addresses – a number that has become largely exhausted by all the connected devices globally. In contrast, IPv6 can support 128-bit addresses, translating to approximately 3.4 x 1038 addresses – an almost limitless number that can amply handle all conceivable IoT devices. IoT is shaping modern business- manufacturing to marketing. A lot has been already changed since the inception of the Internet and many more will get changed with the greater Internet connectivity and reach. The global network connecting people, data and machines are transforming the modern business is also called Industrial Internet. The so called Industrial Internet had potential of $10 to $15 trillion to global GDP in next two decades. 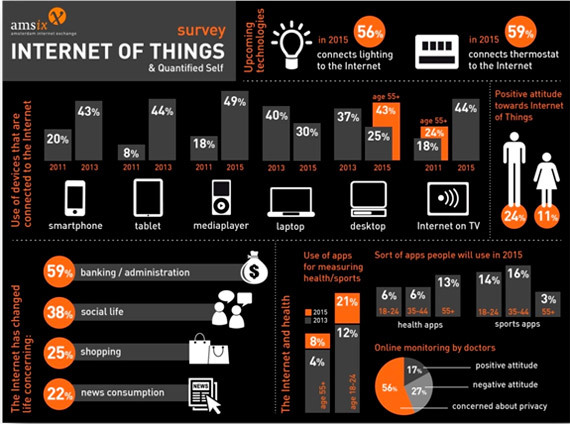 IoT is shaping human life with greater connectivity and ultimate functionality through ubiquitous networking to the Internet. It will be more personal and predictive and merge the physical world and the virtual world to create a highly personalized and often predictive connected experience. With all the promises and potential, IoT still has to resolve three major issues, unified standards for devices, privacy and security. Without the consideration of strong security at all joints of the IoT and protection of data, the progress of IoT will be hindered by litigations and social resistance. The expansion of IoT be slow without common standards for the connected devices or sensers .